Plate 8 from the fourth set of Thomas and William Daniell's 'Oriental Scenery,' which they called 'Twenty-four Landscapes.' The views progress northwards from the far south at Cape Comorin to Srinagar in Garhwal in the Himalaya mountains. This riverside view on the bank of the Hugli is set in a sacred grove as suggested by the little group of villagers seated around a memorial. The artists noted that the carved wooden pole near the water was erected to commemorate a deceased wife. 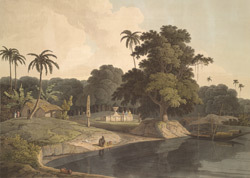 Bandel, on the west bank of the Hugli, is the site of one of the former Portuguese settlements in Bengal.